When I first moved to Morocco back in 2012, I had just spent a year living and working in Lyon, France. Granted, I hadn’t taken any French lessons before arriving (aside from a bit of listen-and-repeat audio training), and in fact French was never originally on my list of languages to learn, nor France on my list of countries to try living in, but still I found learning French to be more of an uphill battle than I was expecting, and it wasn’t until the move to Morocco that I realized why that was. My fiancee is Italian. My Italian is decently conversational, but there’s something so very rewarding about trying out a language and seeing the locals light up with delight at your attempts. It doesn’t matter how badly I botch the word “cappuccino”, or whether I ignore the various articles and genders, or that I can’t seem to pin down the sing-song inflection. I’ve always found Italians in general to be tickled pink that I would even try. The French are not tickled pink, red, or any shade of the rainbow that you have decided to take it upon yourself to navigate their tongue-twisting tongue. Not only do they tend to be standoffish towards foreigners (this being a direct quote from a French fellow I met in my first week, who informed me of this fact before abandoning me at the bar), but they would rather soil their mouths with the sickly rounded Rs and twanging As of English than endure listening you hacking their precious language into viande hachée any further. Now, believe it or not, I sympathize completely. For centuries, French was the international language of business, diplomacy, and culture, a fact about which the French are understandably proud. Czar Nicholas II of Russia wrote his czarina in French. Frederick the Great of Prussia (German-speaking) declared French “universal.” Even Marco Polo, the Italian explorer, wrote the original chronicles of his adventures in French. Since then, however, French has taken something of a beating. The Treaty of Versailles was written in both French and English, more and more Francophone countries teach English to their businessfolk, and American English computer-related terminology attacks French on all fronts, despite the French nobly clinging to l’ordinateur and numerique (English, of course, has stolen and absorbed hundreds of French words and terms, from répondez s’il vous plaît [RSVP] to déjà vu to à la mode, and nobody makes a fuss…bon, c’est la vie). Nobody likes to be relegated to the #2 spot, least of all the French, and especially not to a language so lumbering and inelegant as English. They want to preserve a beautiful thing. I feel their pain. But it doesn’t make it any easier to learn the language. So even after a year in Lyon, my French was pretty poor. I chalked this up to my own thick-headedness and prepared for three months of misery in Morocco, stumbling and stuttering my way around with my inadequate français. Once in Morocco, however, I discovered something wonderful. 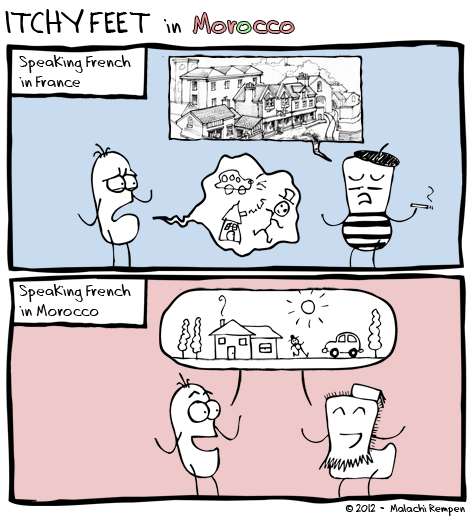 Being a Francophone country, most Moroccans of course speak perfect French. But rarely is it their first language – that’s usually Arabic. And so while speaking French on the streets of Lyon or Paris will expose you to all manner of slang, odd expressions, and rapid-fire pronunciation, not to mention unveiled disdain, Moroccans (and other second-language Francophones) speak a refined, clear, textbook version of French. It’s easier to comprehend, you learn much faster from it, and they couldn’t care less if you botched it. It’s not their language to protect! This is probably true for a lot of languages. Often times, especially as a beginner, it’s far more enjoyable to speak with someone who also speaks that language as a second or third tongue. Sure, you’ll only really get good speaking with a mother-tonguer, but when you speak French with a Moroccan, all the pressure’s off. What are your experiences? Which cultures have you found reward you for trying out their languages, and which ones punish you for it? Malachi Rempen is an American filmmaker, author, photographer, and cartoonist. Born in Switzerland, raised in Albuquerque, New Mexico, he fled Los Angeles after film school and expatted it in France, Morocco, Italy, and now Berlin, Germany, where he lives with his Italian wife and German cat. "Itchy Feet" is his weekly cartoon chronicle of travel, language learning, and life as an expat. I had the same experience learning German in Lugano. It was the second (or third, for them-) language for most of us, and we butchered it happily, glad that we could communicate. That early success was probably why I continued to be interested in languages. @Trisha Ray That’s exactly what you need, a community of people with no regard for the language’s dignity! Yes, I notice it too here in Switzerland, at least with Swiss German. As a foreigner, the only German you learn is Hochdeutsch, the German from Germany, even though everybody speaks Swiss German, who by some accounts, sounds like a totally different language. Even with my botched, primary, full of errors German I can be understood to some degree and things usually get along very well. I want to give my point of view because my girlfriend is American and I think it seems dangerous to draw radical conclusions only with a personal experience and relatively short. I will not take for example my girlfriend because she is very gifted for languages ​​and her learning of French was not done in the same conditions. But I’d rather talk about my professionnal experience during which I could frequent two students in architecture: one was Chinese and the other Ukrainian. Both were beginner in French upon arrival. If it was been more difficult for the Chinese that the Ukrainian, both have made ​​enormous progress in one year. You should also know that the French are generally not very gifted for languages(you can read it actually). But all the French study English for at least 4 years. So, they often have the bad reflex to try to facilitate the understanding using English … especially with English speakers. Please do not think that it is to show their superiority. The French are aware that their language is very difficult to learn and I think most of them respects foreigners who speak French. I had a different experience trying to learn Russian in Latvia. Everyone spoke Russian, but many Latvians were reluctant to use it and preferred to speak in English. @Ch So-called Baltian ex-Soviet nations are well-known for their Russian language rejection. If they don’t speak English, they still prefer they native language over Russian. I never studied their history good enough, so I don’t really know why they are so really bad about the language. Surprizingly, the better place to learn Russian in Europe is Belarus. In Ukrain, Russian is widely used, but Ukrainian is pushed to the media and official use, and even native speakers often have non-standard pronunciation. Actually, it’s also easier to understand non native speakers in english. By the way, i don’t know why english speakers always choose this example…but “ordinateur” is a bad example, it was chosen by IBM, because “compute” consists of 2 dirty words in french. In general, computer (and scientific)-related terminology are not good examples to illustrate an “attack on all front”, because many words are close to french. It’s not new : english and french vocabularies have a lot in common, half of the words being identical or similar. And today, english words, when they are useful, are welcome! As far as French is concerned, try speaking it in Quebec. You’ll see faces light up as soon as you speak French with an accent: we love defending our language, and having a non-native be willing to learn it is the greatest pride. If you can learn a cuss word or two (they are NOT the same as the ones in France, or the rest of the French-speaking world for that matter), you’ll have a friend in any bar or pub. @JD Great! I’d love to visit Quebec. Actually the big plus of learning French is, in my opinion, all the other Francophone countrymen you can communicate with. I have a French-speaking Quebecer friend that I met in Lyon, and he was always bummed out because he’d sit down at a restaurant and order and the waiter would look at him and say, “we don’t speak English here.” And he’d say, “I’m speaking FRENCH!” I guess the accent is pretty strong? French people would say it sounds “rustic”, to which we usually answer with bits of pride that it’s the same French the King of France spoke 400 years ago. We pronounce sounds differently, we skip more letters, we have plently of words they don’t use anymore/they never used. But above all, they are not as exposed to our French than we are exposed to their French. …Which barely excuses how they could mistake Quebec’s french for English. That’s exreme, hehe. I live in Grenoble, yeah the Rhone alpes! and still can’t speak French! It’s been almost a year now. It is too expensive here so I am thinking of moving to Morocco to learn french for about 3 months. Did you take classes there? if so which city and school? Morocco is great. It’s cheap, the people are super friendly, and the food is great. I did not take classes, my French developed purely out of a need to speak it, but they must have classes. After all, all the Moroccans are learning it! I do think if you do take classes, you should do one that teaches you IN French. Meaning don’t get one that teaches you French in English. In Berlin I learned German in German and it was super difficult at first, but by the end it was so much faster. Having been on camping holidays to France for many years I have to admit I always thought that the French people I met were rather pleased that we took the time and effort to at least have a go at their language. They always appeared quite understanding and helpful in trying to show me where I’d gone wrong. @Tim Any French person that camps probably has a more relaxed attitude about everything anyway! But I am so admired by french culture and I thinking about learning french as third language by finding similarities with english that I already speak would that help ? @Beginner English and French have certain similarities, but they’re not THAT similar. But if you love French culture, absolutely take French up! It’s not as hard as it looks.